Micro-transactions will be cosmetic only, with Perk Cards being only obtainable through leveling up. Bethesda has clarified some questions that the fans had during QuakeCon, with two of the biggest concerns being how the game will handle PVP Griefers and Micro-transactions. These were concerns to Bethesda’s fans, after they announced that Perks would be earned through collectible in-game cards. 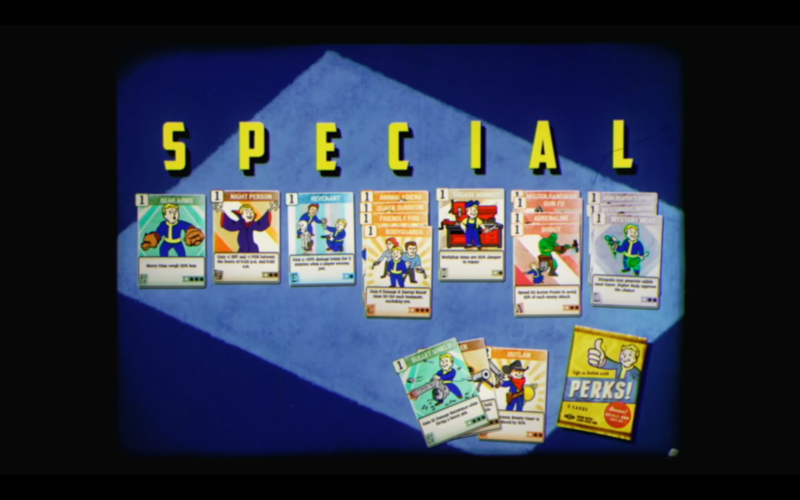 In terms of micro-transactions, Bethesda has confirmed that the Perk cards, cards that will grant the player perks that are associated with one of the seven S.P.E.C.I.A.L stats, will only be available by leveling up. Micro-transactions will only be used for cosmetic items, and the revenue from these micro-transactions, will in turn allow for free DLC to be available to all players. These perk cards will be given to players every second level, up until level 10, after which players receive one every 5 levels. You can only have a certain amount of cards equipped, but you can share inactive cards with friends who are travelling with you to make the most of them. You can also swap them out for other perks when you want to. As for Griefing, Bethesda has a well thought out solution. To start a proper PVP duel, players can shoot another player, but it will only do a small portion of damage. Todd Howard compared this to “slapping someone in a bar”. This way, you are telling a player you want to fight, without breaking immersion, but also without killing them instantaneously. That player can then decide to shoot back, in which case, both of you will begin doing full damage to each other. Otherwise, you continue to do small amounts of damage. If you manage to kill the uninterested player however, with the small amounts of damage, you gain no rewards, no experience points and you become a target on the map for other players to hunt. A bounty is placed on your head for players to hunt and kill you for, and the bounty is taken out of your pocket. That’s right, the Griefer will pay their hunter with their own caps, for killing them. In short, the balancing of multiplayer has been thoroughly thought out. Do you think the punishment is fair? What do you think about the free DLC? Do you whats your thoughts on the perk card system? Join the discussion below. The Walking Dead: The Final Season Cancelled, After Telltale Begins To Close Doors.